Sean Jackson of Copyblogger recently said, “SEO is dead.” He continued, “not the practice, but the term.” Jackson felt, rightly so, that in recent years SEO had come to stand for the spammy, often unethical practices ofsneaky “black-hat” SEO practitioners. As Google has cracked down on these practices and as consumers have moved to other avenues of finding content (social media sites, blogs, aggregators, etc. ), SEO has been swallowed whole by a much broader set of necessary considerations. Jackson readily admits that many legitimate SEO best practices are still not only relevant but are highly effective with the rising importance of all forms of content. Instead of simply declaring SEO dead, Jackson argues that it should be incorporated into a new, more comprehensive framework for outlining the necessary approach content marketers should take to promoting and building content effectively — a framework he dubs OC/DC, or optimizing content for discovery and conversion. OC/DC is a more holistic and goal-driven approach to content marketing. SEO’s narrow focus not only does not address all the avenues through which consumers now discover content, but its tight constraints also can negatively influence the content creation itself. The rest of this article will highlight various strategies and guidelines, showing you how to optimize website content for SEO, discovery and conversion in the coming year. Google has made it crystal clear that it will always favor content that is valuable to people over content that is written primarily to rank for Google. Not only have they emphasized this over and over on their blog, they’ve made dozens of changes to their search algorithm that reflect this decision. There are certain SEOs (the ones who don’t seem to heed Google’s warnings) that live in constant fear of the next Google algorithm change. The reason for their concern is that the content they produce and the SEO tactics they use, in large part, pander to Google’s algorithm changesinstead of actually suiting and serving real readers. Creating quality content is hard, and these workarounds and hacks can seem like tempting avenues to high search engine rankings. However, constantly having to pick up the pieces when Google penalizes your efforts is probably more costly in the long run. That’s because creating quality content from the outset might require more initial effort, but will all but guarantee that you will be immune from Google’s constant updates and very well might be helped by them. That’s because your content will be the material that Google hopes to promote instead of the keyword-stuffed spam their engineers look to punish. As we will discuss later, many SEO best practices are still very much necessary in ensuring your quality content gets discovered, but these optimization considerations are much better reserved for after you focus on creating high-quality, targeted content created to serve your audience. Before you even begin strategizing on how to make quality content, you need to pin down exactly what constitutes high-quality content in the first place. This is a daunting task, but luckily Google provided a wonderful outline of what they see as indicators of quality content. This question is so important because any rubric for judging quality content will be intimately linked to the readers and audience you are attempting to reach and appeal to. The first stage of content planning and strategy should be to seriously consider your audience and their genuine interests. Every business or product has something unique about it. Even if you are competing in a crowded space, if your business has enjoyed any kind of success it’s because you’ve offered something that no one else has. Whether it’s a focus on cost-savings, or a quirky sense of humor, or an emphasis on professionalism. Any one of a variety of factors can be identified as part of your brand’s true story. As a content marketer, your goal is to create content that appeals to your audience in a way that mirrors the appeal of the product this content marketing is calling attention to. In fact, a smart content strategy can naturally lead to conversions if it is appropriate to your product. The more you can narrow down the unique appeal of your product or service, the more likely your content is to appeal to the “genuine interest of your readers.” Considering these are the very words that Google used, any content marketing that makes good on this goal will likely be favored by Google’s current and future algorithms. The Quicksprout blog has put together a wonderful step-by-step guide to developing a content strategy based on a unique set of customer interests. This guide is quite in-depth but the main ideas are fundamentally simple. Find a niche that is narrow enough to be unique, but broad enough to meet your business objectives. Locate your ideal customer within this niche and discover what blogs they read, what social sites they use, what kind of events they attend, etc. Create a persona reflecting this average customer and try to gain an understanding of their demographic makeup as well as their psychology, beliefs, etc. Use this persona as a guideline for focusing your content marketing efforts. What makes this approach so powerful is that it makes discovering and appealing to you customer’s genuine interests a central focus. This aligns your content with the goals of Google and other search providers. So even though this is not “SEO” in the sense that the term has come to be understood, creating content from a plan that looks like this will certainly go a long way towards optimizing your content for discovery by search engines. Further reinforcing the importance of this kind of content creation strategy, and the SEO benefits it can translate into, it’s important to understand Google’s recent focus on something called semantic search. Semantic search takes the often fragmented, non-specific search terms people naturally use and attempts to parse them and extract a more robust meaning. In simpler terms, Google has begun to focus on taking a string of basic, broad keywords and teasing out the core concept they all belong to. This is important for content marketers because it diminishes the overall importance of isolated keywords in determining search rankings. Instead, focus on covering a few key issues of importance to your audience with each piece of content you’re creating. “The reason behind it is that Google is trying to work out the meaning of pages and favoring pages that answer several questions a person may have,” he added. “The implication of this new approach is that, as a marketer, you need to produce longer content that answers several possible search queries, queries that include data points would feed Google’s desire to understand details about the topic,” said Newlands. Since the incorporation of Google+ and personally tailored search results, a focus on keywords, links, and anchor text has become less important than making sure your overall site, and each piece of content on your site, addresses and has authority on certain concepts — especially multiple topics within your niche. Now that I’ve highlighted the importance of defining your niche for SEO, and how to develop and plan quality content tailored to that niche, there is one important piece of the puzzle remaining. The aim of all your separate pieces of content, as well as your overall content strategy, should be to ultimately build authority for your site in a certain topic. Authority has always been a component of Google’s search. Even in the most rudimentary iterations of Google’s PageRank algorithm, outbound and inbound links were used to gauge authority. However, as Google has moved more toward personalization and semantic search, authority on a narrower subject has become not only more important, but actually has become a lot less difficult to achieve. Especially if you define a niche well enough and choose this niche appropriately for your business. In his book “Google Semantic Search,” David Amerland argues that the “four Vs” that govern big data processes can also be used to inform SEO and content marketing decisions (if you think about it, understanding Google’s search engine is nothing but a big data problem). Volume. This is the simplest of the four, but the amount of material you put out about your topic of choice will be a big indication to Google of your authority on the subject. Velocity. The overall frequency of your content will also give Google a hint as to your expertise. Posting once a week for a year, likely looks better than posting once a month over the course of four years. Variety. While you don’t want to venture too far with your content’s subject, covering a variety of areas within your niche of choice will signal to Google that you have authority on the topic. Veracity. Having content that is received well by readers (that is shared, talked about, etc.) is perhaps the strongest indication to Google that they should serve content from your site to readers interested in the concept you chose to focus on. Focusing on making sure your broader content strategy satisfies the conditions of these four ideas will ensure that your individual quality pieces of content end up constituting search benefits that are greater than the sum of their parts. Once you have ensured that you have identified your audience, understand what interests them, are producing quality content for your niche, and are doing so in a way that is establishing your site’s authority, then you can start thinking about “traditional” SEO considerations. Traditional SEO is kind of like rainbow sprinkles. On a vanilla ice cream cone, sprinkles can improve the whole experience and can actually offer people additional value. But if you give someone just a pile of rainbow sprinkles, you won’t be giving them anything they really want and will likely just leave a bad taste in their mouth. In much the same way, legitimate SEO best practices such as linking to other relevant posts within your blog, providing accurate keywords within headlines and anchor text, and properly tagging and categorizing your content can really offer a lot of additional value to readers. If these best practices are followed in addition to providing quality content that people want to read, then they will not only enhance the user experience, they will make this great content easier to find. However, if best practices are not incorporated into a broader content strategy they will likely do more harm than good. In fact, this is exactly what Sean Jackson was saying when he claimed “SEO is dead.” It doesn’t mean that these practices are dead, but if you’re notcreating awesome content, they’re essentially useless. How do you incorporate key SEO tactics when creating content for your business? Share your experience in the comments below. While looking for keywords and content ideas, we sometimes draw a blank. Either we know little about the field, or just cannot find relevant content online. Maybe, we aren’t getting enough keywords to get started or just have run out of ideas. This article is for such times. For times when you would prefer going head first into a brick wall than writing articles because you have no ideas or inspiration. Part of effective growth hacking is to publish engaging content – on your website and in e-mail newsletters. Content works when you speak directly to readers and answer their questions. The best way to design engaging content is to build it around the right keywords. This doesn’t just help in PPC and SEO but in conversions also. Plus it saves you the time and effort spent in targeting irrelevant keywords and ranking high in them – something which yields no results. 2. They give you ideas for content that ranks well in searches and is shared more. Let’s assume we know nothing about garden furniture. And let’s also assume that we know just 1 competitor – Fabfurnish. And maybe their keywords are cleverly hidden, stopping us dead in our tracks. 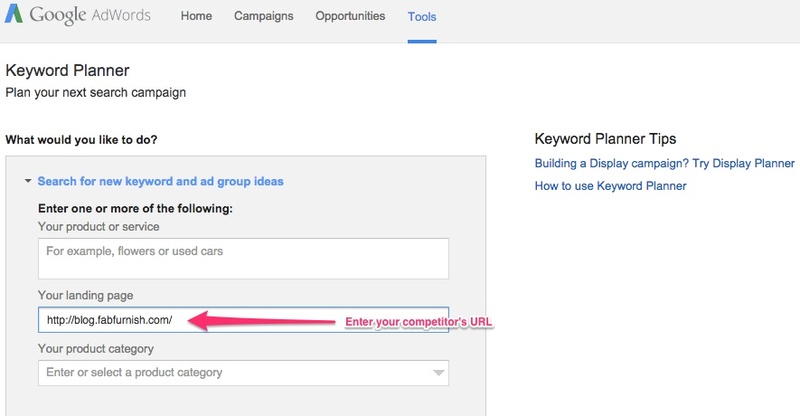 In such cases, Google’s Keyword Planner Tool lets us insert the competitor’s URL and generates the ideas for us. The keywords thrown up by the planner may not necessarily be the ones that are targeted by Fabfurnish, but they will offer enough suggestions. As usual, sort these keywords by number of searches, competition and suggested bid to choose the ones that will suit your needs. Enough juice to get you started? We’ve been blind to Wikipedia’s usefulness for content writers. That was until Neil Patel pointed it out. Wikipedia is a great place for generating additional ideas, many of which your competition may not have thought of. 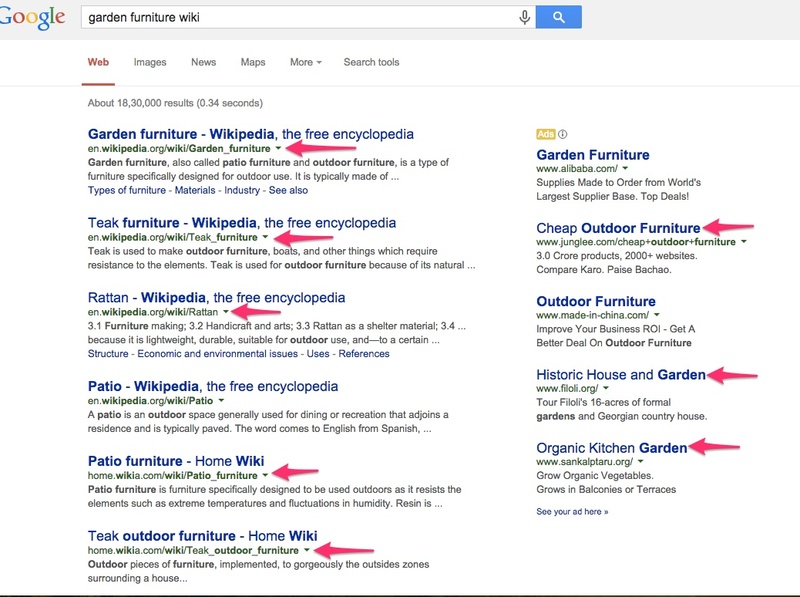 Type your search words followed by Wiki in the Google Search box and collect all the suggestions. You’ve got about 6-8 additional keyword ideas. Add them to your excel sheet. Then click on each search result and browse through the hyperlinked words in the Wiki pages. These serve as good keyword suggestions since your competitors have linked to them. The search result suggestions are present for a reason. The reason being that people use them frequently while searching about your subject. Leverage them. Copy all Google SERP suggestions into your Excel file. 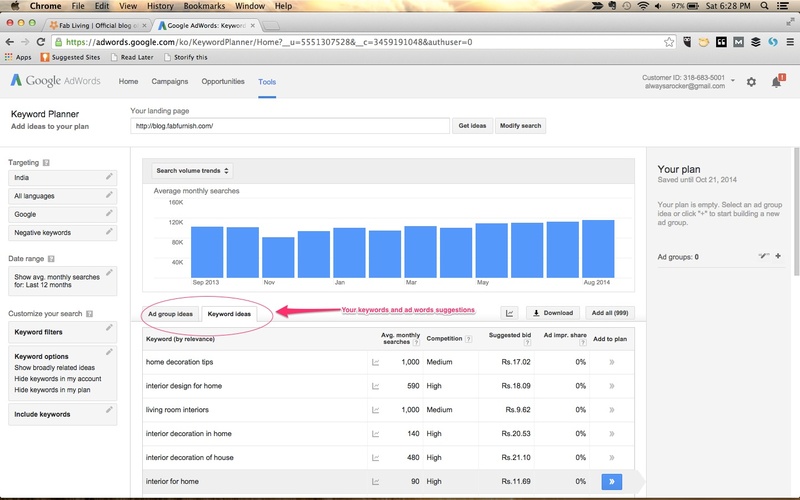 Then check the viability of each keyword using the Keyword Planner tool or Moz bar. If you’re lucky you will find long tail keywords too. Choose the ones which best suit your needs. They will let you build and curate killer content that will serve you well for months. 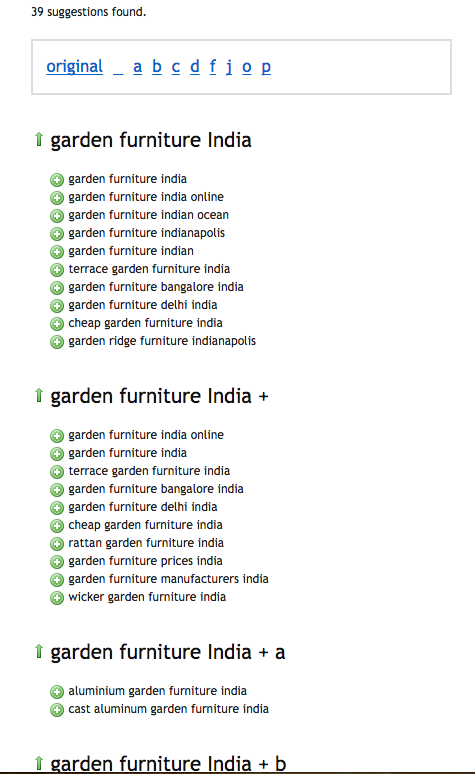 These are the results which showed up for ‘garden furniture India’ in the Google SERP. Imagine the number of suggestions you will get once you enter each targeted keyword. If you can find your way the oft occurring past 502 errors and a cluttered UI, Ubersuggest is quite a nifty tool for keyword ideas. The suggestions are not sorted by popularity, nor do you find details half as elaborate as the Google Keyword Planner. But you get large set of keyword suggestions including long tail ones. As the tagline says, this tool offers keyword suggestions on steroids. Another tool that featured in one of Neil Patel’s articles, but not spoken about often. Not much is known about this company, but it offers a host of keyword suggestions. Again, these keywords are not sorted by popularity or competition, but they’re useful insights into what your potential customers are looking for. Suggestions in this post are not for finding keywords solely for the purpose of creating links and trying to improve your website’s SEO score. Rather they’re suggestions for you to get a peek into your potential customers’ minds. These keyword ideas will help you design content which establishes you (or your brand) as an authority. Keep publishing engaging content and no Google algorithm change will affect you. Further, these steps will help you sharpen your skills as a content writer; even make you a sought after person in the industry because you can work your magic in ways few others can. When the keywords that you target start driving traffic to your (or your client’s) site, you will become a rockstar! Clubbed with tools to monitor social media conversations, they will help you answer questions of potential customers. Questions addressed by no one yet.